'Stuart' (Nut photo) Seedling selection from the orchard of J. R. Lassabe at Pascagoula, Jackson County, MS. Lassabe planted the orchard about 1874 using nuts of unknown parentage obtained from Mobile, AL. After the orchard was purchased by Captain E. Castanera, the tree gained fame for its high yields. First propagated by A. G. Delmas in 1886 as 'Castanera'. Propagated about 1890 by J. Keller and Col. W. R. Stuart of Ocean Springs, MS under the name 'Stuart'. 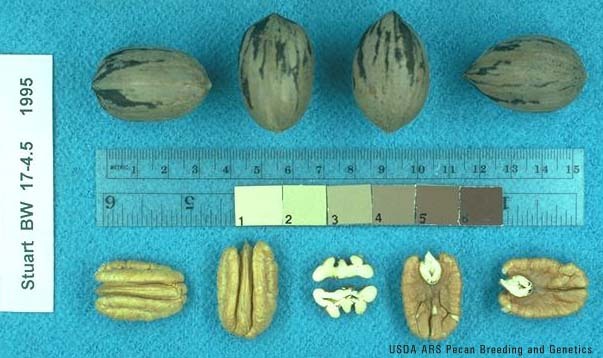 Nut: oblong elliptic with obtuse apex and rounded base; round in cross section; dark stripes on shell; 51 nuts/lb, 49% kernel; kernels golden to light brown in color with wide, shallow dorsal grooves, deep secondary dorsal grooves and a pronounced basal cleft. Protogynous with late pollen shed and mid-season pistillate receptivity. Resistant to scab. Susceptible to downy spot, black pecan aphids, and yellow aphids. Late to begin growth in spring, making the cultivar hardy in North GA, AR, and OK. Slow to bear. There are more acres of 'Stuart' trees than any other cultivar. Recommended (1990) for planting in AL, AR, FL, GA, MS, NC, OK, SC and TN.